Why Is the Brain Wrinkly? If you were to pull out your brain (don’t…), you would find that it was covered in wrinkles a bit like a prune. This is due to something called ‘cortical folding’ which is also known as ‘gyrencephalization’. In fact, the individual grooves even have names: the indents are called ‘sulci’ while the bumps between them are called ‘gyri’. So what’s this all about? This cortical folding is designed to make the brain more efficient thus allowing us to get smarter. If you look at the animal kingdom, then you’ll see that ‘smarter’ animals have a denser brain in relation to their size. Elephants have far bigger brains than humans, but that’s because they have much larger bodies which require far more coordination when moving around and keeping alive. If you were to compare the human brain to another animal our size – like the chimpanzee – you would find that our brains were much heavier which indicates more intelligence and a greater capacity for higher order thought. The problem is that as we have evolved to become more and more intelligent, so have our brains become larger and larger. This has led to our skulls getting bigger, but that’s problematic seeing as our mothers need to give birth to us. This is actually the reason that human babies are born so underdeveloped when compared to animals. A baby calf can walk within no time at all, whereas humans take years to develop the full gamut of skills. This is also why human babies are born with soft skulls – so that their brain can continue to grow after birth. That’s one explanation, but there’s also another one that’s even more incredible. You see as our brains get bigger this could actually lead to slower thinking because the signal will have farther to travel from one point in the brain to the other. This would be a problem and so by folding the brain in a specific way, we are able to bring certain areas closer to each other (the same way that science fiction imagines we might travel through space using wormholes and bends in the fabric of space-time). White fibre is what connects the different areas of our brain, and this way there is less white matter for signals to travel across. It’s an incredibly smart solution which shows just how inventive our brains really are. Interestingly our brains are also more wrinkled in different areas. 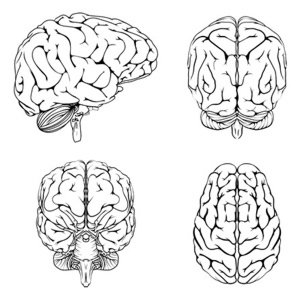 The most wrinkled part for instance is the front of the neocortex – where most of our abstract thinking takes place. And in keeping with all this, it’s also true that those animals that are capable of less ‘advanced’ thinking have much smoother brains. While the brain of the manatee is quite large for instance, it is completely smooth suggesting it is less capable of higher order thinking. What Is the ‘Extreme Male Brain’ Theory of Autism?